Catching up with yesterday’s adventures from the comfort of our lovely room overlooking the Dead Sea. When we opened the curtains and looked out over the Petra site first thing yesterday morning, we half expected to see a dusting of snow. Thankfully, that was not the case though it was chilly and there was a stiff breeze. We packed up, checked out and met Mo and Nabil in a bustling hotel lobby. One large group checking out were wearing National Geographic logos and a sign identified them as the “Around the World” group. Later, I looked up their itinerary….what do you reckon? We were driving to Little Petra first of all, high above where we’d been yesterday, catching tantalising glimpses of the facades from time to time. We made a short stop for us to jump out and take photos, but as is the way here, there’s often something else going on nearby. A couple of horses were mooching around on the road, quite happily until a truck came round the corner and surprised them. 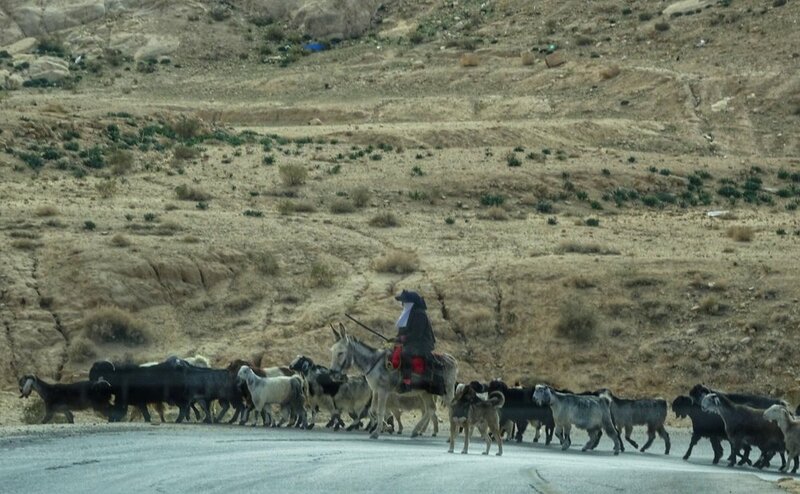 Around the next corner was the goatherd, wrapped up warmly against the cold. Maybe he had been out all night? 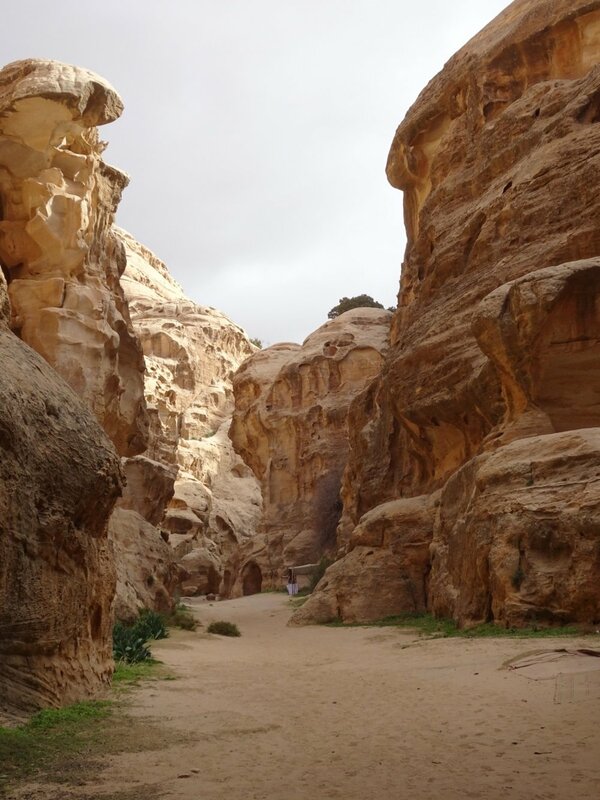 Soon, we were at Little Petra - somewhere we’d been before. I had taken this photograph in 2008, when we dined under the stars on a freezing cold night but didn’t see much more than this. Eleven years later in daylight, it was much as I remembered…except there’s a whole lot more! We followed Mo as he took the pathway to the left of the previous picture, though a narrow siq, much the same as we’d walked yesterday, though on a rather smaller scale. Soon, we were in front of this triclinium, looking inside and being amazed by the structure, which was neat, straight right angles. 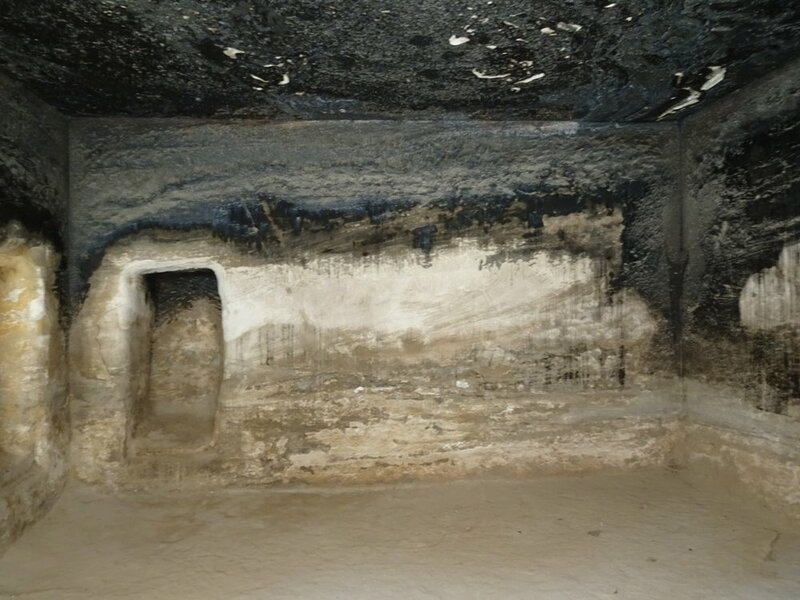 The Nabbateans were certainly careful builders with an eye for detail, though the Bedouins who lit fires in these “caves” (for want of a better word) did them no favours - hence the black tarry covering of the ceiling. As we poked about the structure on one side of the siq, we heard a voice from the other side call “Hello! Where are you from?” We looked up to see two figures sitting on a ledge high above the ground. We replied “UK” and asked the same of them. One answered “here” and the other “Brazil”. We left them to enjoy their smoke - whatever it was - and I resisted the temptation to tell them to be careful! Yet again, we were fortunate to share this place with just a handful of others, finding it peaceful and unspoiled. There was just the one Bedouin chap sitting by his small fire at the head of the siq, smoking and chatting on his mobile phone. In common with most of the traders here in Jordan, he didn’t seem very anxious to sell anything to those passing by - it’s great being somewhere like this and not feel pestered! Now, my Hero and I needed more persuasion than a handwritten sign like that to even consider climbing those steep steps, some of which were not even steps at all. We watched as people younger and more agile than us struggled, not so much going up but most certainly coming down and decided we’d sit this one out. After all, we had younger and fitter members of the family to do the sightseeing for us. Firstly, looking down to where we were standing, waiting and trying hard not to watch. And secondly, “the best view in the world” - yes, it was possible to go further, I understand, but the way was closed by a Bedouin who was collecting extra money for the next stage! We missed nothing, it seems, save for the pride in our achievement. Mo had followed his now-familiar plan by leading us to the furthest point, then giving us half an hour or whatever, to return independently and meet him where we’d started. It worked well - we got the benefit of his knowledge and experience and yet had time to revisit and spend a little longer at our own pace taking photographs and savouring our favourite aspects of the place. He had the benefit of a quiet ten minutes more back at the car for a smoke! Reunited back at the car, Nabil headed back towards Wadi Mousa, stopping for a while to allow another herd of goats to cross whilst Mo explained the importance of the donkey. He told us how a donkey is always given the strongest billygoat as company. As the billygoat grows and becomes the alpha-male in the herd, it aligns with the donkey rather than the other goats making it easier to keep the herd together. Whether or not he operated a similar herding theory to the groups he guides, we will never know as we four were always perfectly behaved and followed his every instruction to the letter! We continued our journey beyond Wadi Mousa and over the highest road in the country, encountering frosty deserts along the way. Join me in my next post for the next chapter!